Yet another variation of a polar Raketa, but this time with no logos or pictures. 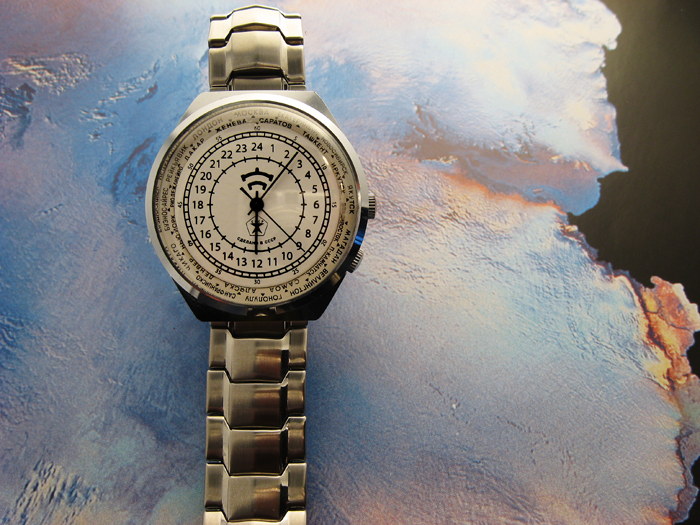 This one has a simple, yet clear, hour scale, minute scale and rotating world cities bezel. The thin hand are well adapted to this information packed dial, and the watch has a very “technical” feel to it. These “polar” Raketas come in many variations and are easy to find on Ebay and elsewhere. They are cheap, yet clearly popular. Of all the Raketas I have ever seen, this one has the best designed dial. According to the Raketa website, the dial of this watch is made in the same style as the instruments on Russian aircraft from the 1936-1948 period. Whatever may be the case, the face of this watch is extremely well-designed. 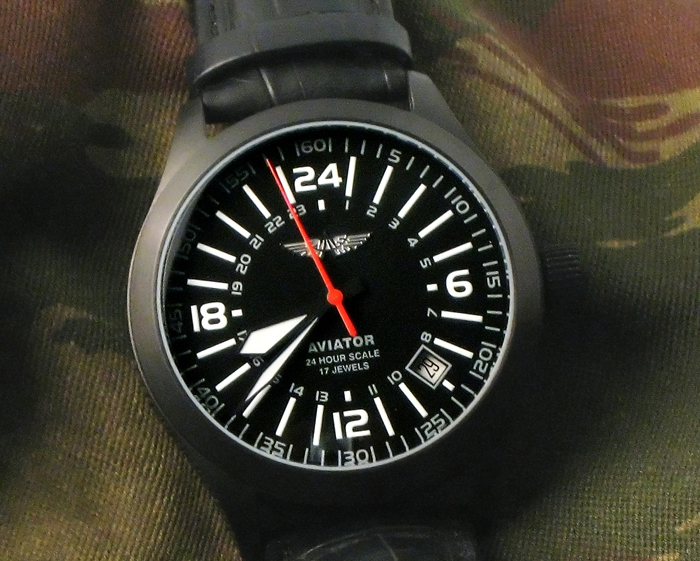 It definitely has a “military” feel to it, and while the luminosity of the hands and numbers is not as powerful as the super-luminova found on Aviator or Sturmanskie watches, it is still very decent. Considering the legendary high quality of the Raketa mechanisms and the superb dial, it is absolutely baffling that such a watch can be purchased for about 40-50 dollars. This watch is, in my opinion, the best possible choice for somebody wanting to try out 24 hour watches but being unwilling to invest in an expensive watch. My first Raketa. You can read the story of how I got it in the FAQ section (“What triggered your interest”). This is a *great* watch. Not only does it have the Imperial Eagle of Russia, but it has a rotating bezel with one city for each time zone indicated in Russian. I have never seen this model elsewhere and I consider it one of my most precious watches as it has this unique personality which only Russian watches really have. Yet another iteration of the seemingly endless supply of Raketas. This once has a nice, elegant, face. But the real reason why I had to get it is that it features a couple of penguins. The penguin is the mascot of the Linux kernel, the heart of the GNU/Linux free operating system. As a proud and card-carrying member of the Free Software Foundation and the Electronic Frontier Foundation I simply had to get one of these watches. Wearing it celebrates the fact that I have been 100% in the marvelous world of free software since 2000 (of course, this website was also designed with free software). Of course, the real purpose of this watch was to celebrate the Russian exploration and science stations on the South Pole, but I choose to see it as an endorsement of the values of freedom. 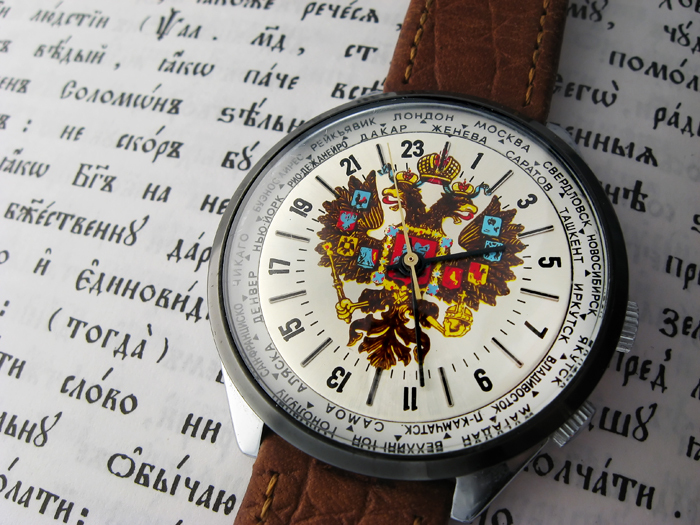 This has got to be the weirdest of all Russian 24 hour watches ever made. First, it is absolutely huge. Bigger than any other watch you have ever seen: about 58mm across, with another 12mm for the crown (which, by the way, is enclosed into a special attached compartment), and 22mm thick. It weighs an absolutely stunning 330 grams! Combine this with a heavy neoprene strap, and you have an absolutely unwearable watch. On top of a wetsuit it might look more appropriate, but should you really go diving with it? Maybe, maybe not. While the case appears to be well closed and sealed, there is no indication of how water resistant this watch really is. But this is not the weirdest thing about this watch. The weirdest thing is that nobody seems to know who actually built this watch. While there is no doubt that this watch was built in Russia, nobody knows by what manufacturer. Before buying this watch, I had read a warning on Ebay about fake Russian dive watches aka fake Zlatoust watches, but I did not care that it was not the type of watch actually used by Soviet divers in the 1970s and that this was only a recent Zlatoust copy. I knew that this was a a) Russian b) 24 hour and c) dive watch, and this was good enough for me. After getting this watch, I got more intrigued and I wrote to the “Agat” factory which makes the Zlatoust watches to ask them about my model. I got a reply from their deputy director, Sergei Ivanovich Fedotov, who told me that Zlatoust had stopped making any diving watches 30 years ago and that “somebody” had “covertly” issued a series of Zlatoust fake watches. I was rather puzzled. 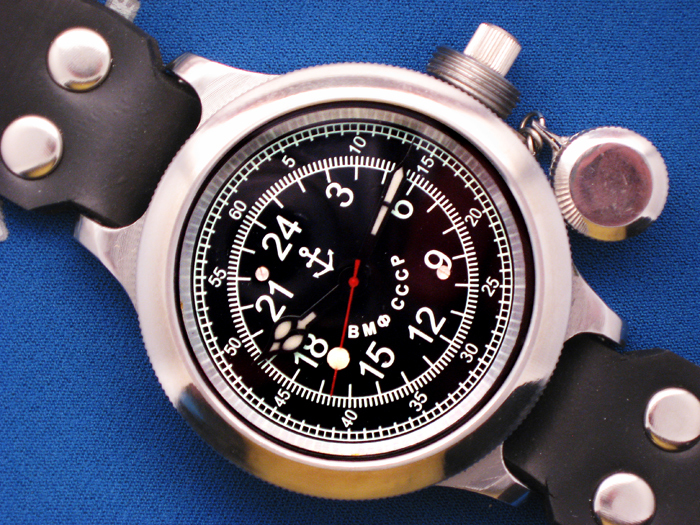 So not only was this not an original Soviet dive watch (which I knew), but it was not even a Zlatoust. I then noticed on various sites on the Internet that very similar watches were sold under the brand name Moscow Classic (see here or here). I emailed Craig Hester at Russia2all who replied that he had never seen my model in the Moscow Classic brand (even though he is their distributor). So that does not appear to be a Moscow Classic either. The guy who sold me the watch, Poljot Russian Watches on Ebay, only told me “I bought it in Russia”. Nothing more. I ended up asking the experts at the Russian watch forum on Watchuseek . Bottom line: nobody knows who actually manufactured this mystery watch (you can read the full discussion for yourself here). My personal feeling is that this is probably a Zlatoust or Moscow Classic watch, produced with tools and parts which these two manufacturers already have, and which was never officially released. Either because the management of these companies was never informed, or for some other reason. Whatever may be the case, this is, as far as I know, the only 24 hour dive watch produced anywhere. While I would not take it on a dive, I love it as a very original, collectible watch. It also makes for a terrific desk watch, which is how I use it. 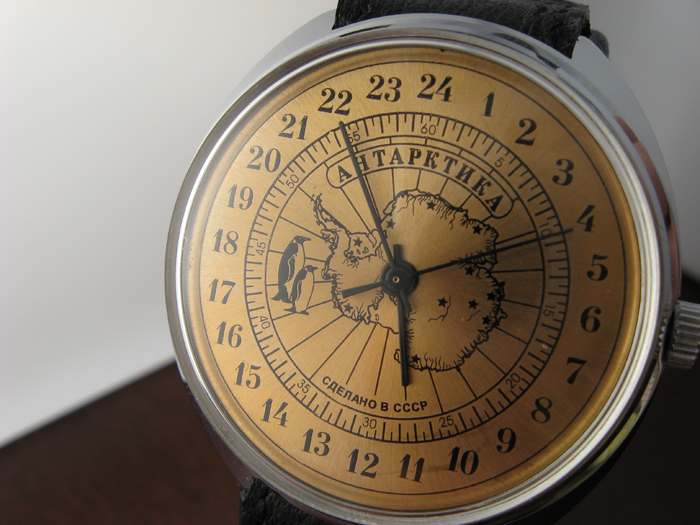 This was my first Russian, as opposed to pre-1991 “Soviet”, watch. 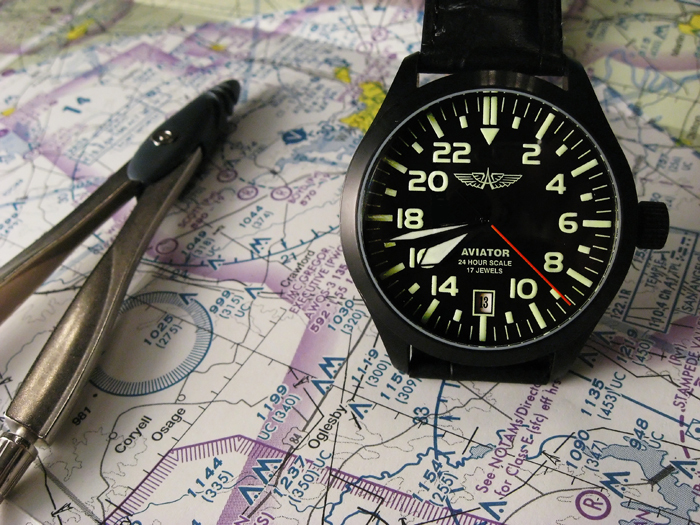 As in the case of the Aviator Military, this watch has an extremely well designed dial. The main difference between these two watches is that this one has all the hours indicated, but only 6, 12, 18 and 24 are in large markings. For somebody already used to 24 hour dials this is probably the best dial imaginable, but for a newcomer to these watches the more conventional dial of the Aviator Military would probably be easier to read. The contrast between the black PVD case and dial, the bright white markings and the red seconds hand creates a very powerful contrast and a highly readable and, frankly, beautiful watch. I should add that the super luminova on these bright white markings on this watch are absolutely as strong as the yellow-greenish ones on the Aviator Military. 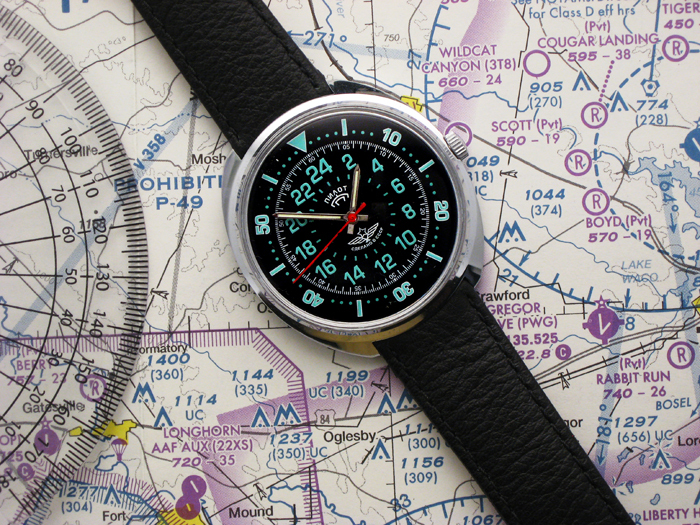 Keeping up with the latest trends, Volmax has built this Aviator model in a large, 45mm, size. The watch is pleasantly heavy and large and comes with a one of the best leather straps I have ever seen. The design of this watch is very original: each number on the dial is surrounded by a small transparent but reflective square which, from a little distance, is supposed to look like the carburetors around the engines of early 19th century airplanes. Well, I am not sure that this is what one would immediately see, but the result is extremely original. The other, frankly counter-intuitive, feature of this watch is that while the hour hand is shorter than the minute hand, the minute scale is inside the hour scale. So you have to project the axis of the hours across the minute scale to read the hours, but you have to estimate which minute the minute hand is covering. This is a little strange and the opposite of the layout of most 24 hour watches. This is a “you hate it or you love it” watch. When I first got it, I frankly pretty much hated it. But after a while getting used to this highly original design, I ended up liking it a lot, in fact. 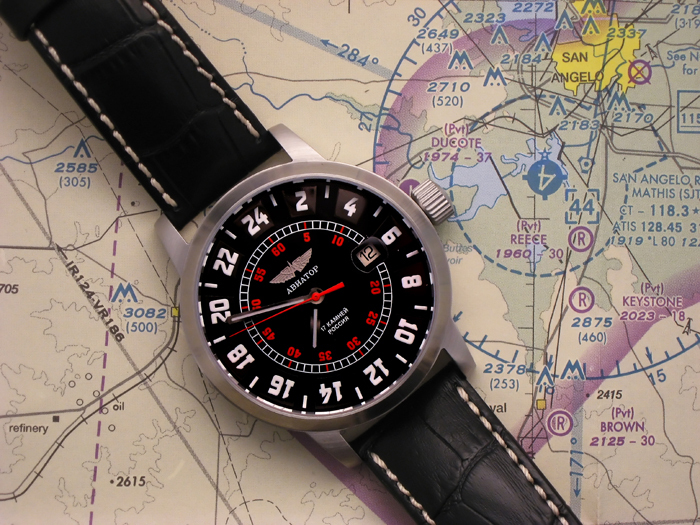 This Aviator model has what is arguably the best dial ever designed for any 24 hours watch: it is simple, highly functional, uncluttered and very easily readable. The Swiss watchmaker Fortis made a similar watch, the Flieger, but with a poorer dial design. Keep in mind that the basic Flieger costs about 800 dollars, the same watch with a PVD case cost about 1’800 dollars while the PVD version of this Aviator only costs about 220 dollars. That is just one example of the stunning value you get with Russian watches. The watch comes with an excellent quality leather strap, but it would probably also look very good with a metal PVD bracelet. It is rated at 5ATM of water resistance. 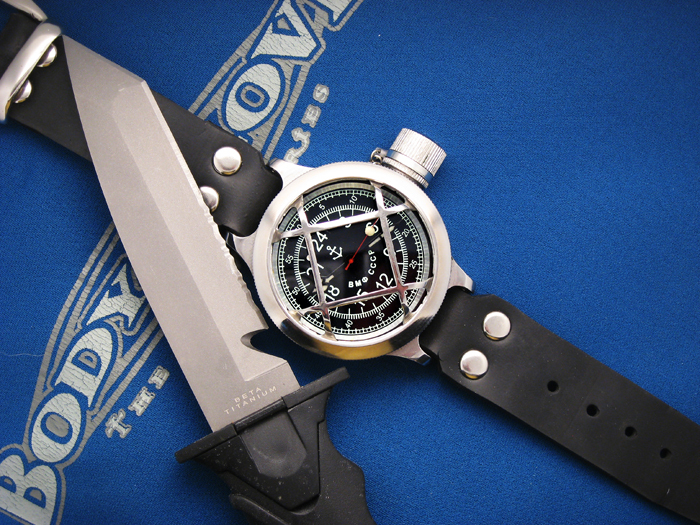 The super-luninova hand and dial marks are very bright and are well visible even after 8 hours. All in all, a truly exceptional watch. 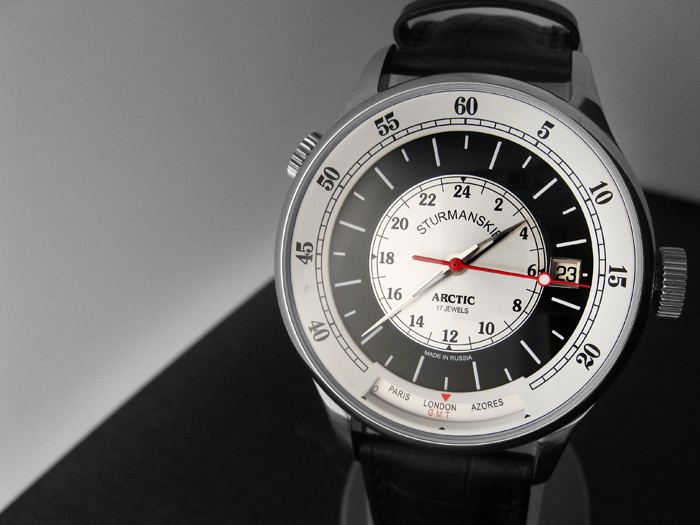 This watch is the basic, low-cost, Russian 24 hour analog watch. The dial has no fancy logos or features, the minute and hour hands are simple and functional, and the only added feature of this model is a simple and highly functional 2nd timezone bezel. In this photo this 2nd timezone bezel has been rotated so that the 2400 hours on the white dial corresponds to a 0900 on the white bezel. In other words, if the local time is midnight the 2nd time zone’s time would be 9 o’clock in the morning. Once this basic time difference has been set, it is easy to tell the time in each timezone. For example if, as in the photo, the local time is 1138 the time in the 2nd timezone will be 2038 as indicated on the black bezel. 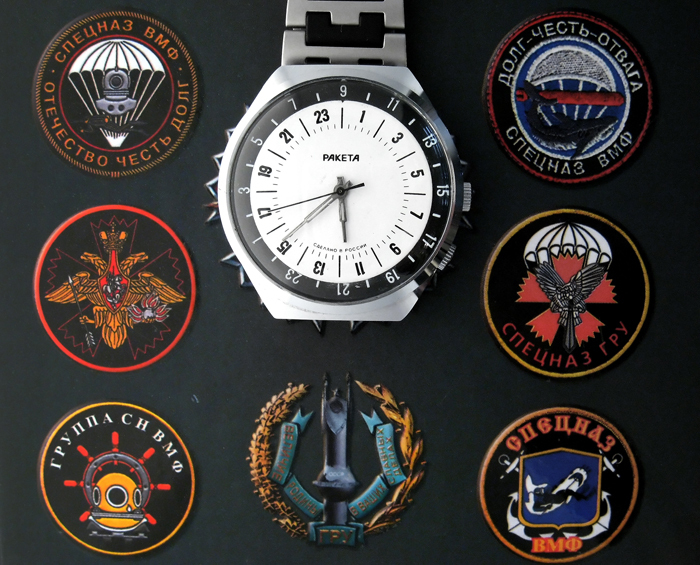 Raketa watches are the cheapest mechanical 24 hour watches you will find anywhere (they go on Ebay for prices ranging from 30 dollars to 60 dollars depending on the model), yet they have very reliable and accurate mechanisms. 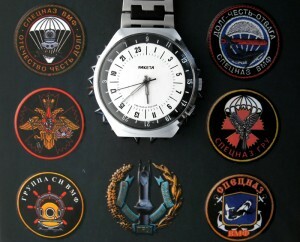 Raketa feature basic, if solid, cases, mostly made out of chrome-plated brass. The water-resistance of these watches is very minimal. Their straps and bracelets, however, are uniformly ugly and poorly made. The first thing I do when I get a Raketa is to immediately throw away the bracelet and buy a new one. Raketas are very much a Soviet-era product: cheap, simple, yet sturdy and accurate. Raketa watches often feature some kind of commemorative dial, sometimes rather goofy ones: usually a piece of military hardware or some Soviet explorer’s feat. I personally don’t like this kind of commemorative dials, but that is a matter of personal preference I suppose. I prefer the more basic and functional Raketas. All in all, these are very good watches, mostly found at absolutely unbeatable prices.